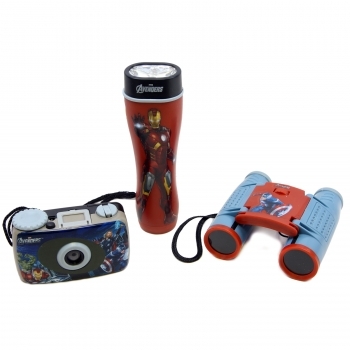 This avengers mission kit will ensure that every child has lots of fun and will certainly bring their imaginations alive when pursuing the mission of his or her choice as it includes a 35mm camera which is focus free and great for capturing observations and uses any 35mm slide or film. It also includes a flashlight which illuminates 10 feet and is great for night excursions and only uses 2 AA batteries which is not included in the package. It is also perfect for nature observations, sightseeing and even sporting events as it has a compact 4x28 binoculars as well. With this spectacular kit no mission is impossible.